Free Drop Billy and Givemeaminit, the respective second- and third-place finishers from the September 4 Hopeful Stakes (G1) at Saratoga, will face off for the second straight time on Saturday as part of a 13-strong juvenile field entered in the $500,000 Breeders’ Futurity (G1) at Keeneland. The 1 1/16-mile affair is part of the Road to the Kentucky Derby series of points races and offers up 10-4-2-1 points toward a starting berth in next year’s Run for the Roses. It’s also a “Win & You’re In” Challenge race and offers the winner an all-fees paid trip to the Breeders’ Cup Juvenile (G1) at Del Mar on November 4. Free Drop Billy is looking for his first stakes win in this spot after just missing by a neck in the Hopeful. The Dale Romans pupil was second in the Sanford Stakes (G3) prior to that seven-furlong affair after taking his maiden debut by three lengths at Churchill Downs on June 15. The Union Rags colt earned a 98 BRIS Speed rating for his Hopeful run and reunites with jockey Robby Albarado in this spot. Givemeaminit also garnered a 98 BRIS Speed figure for his third in the Hopeful as the Dallas Stewart colt was only a head behind Free Drop Billy on the wire. The Star Guitar colt was trying winners for the first time that day, and is still looking for a first win of his own having run second in his initial outing on July 22 at the Spa. Brian Hernandez Jr. will be aboard maiden Givemeaminit for the first time Saturday. Ten City ties with Free Drop Billy and Givemeaminit in terms of highest BRIS Speed rating against this field. The Kenny McPeek-trained dark bay is the only entrant with prior experience at Keenekand, having broken his maiden at first asking on April 19 by seven lengths to earn that 98 BRIS Speed number. He returned June 30 at Churchill Downs to take the Bashford Manor Stakes (G3), but has run third in his past two tries – the Ellis Park Juvenile Stakes and Iroquois Stakes (G3) back under the Twin Spires. Corey Lanerie has the debut call on the Run Away and Hide colt. Captivating Moon will be trying dirt for the first time in the Breeders’ Futurity after breaking his maiden going a mile over Arlington Park’s turf on July 30 and finishing a close second in the Arlington-Washington Futurity on the Polytrack. The Chris Block charge keeps Jose Valdivia Jr. in the irons here. Ready Prospector and Crea’s Bklyn Law are the only other runners in Saturday’s Breeders’ Futurity with prior stakes experience. The former captured a pair of stakes at Evangeline Downs, breaking his maiden in one of them for trainer Oscar Modica, and gets Miguel Mena aboard for his first start outside of that track. Crea’s Bklyn Law broke his maiden in his fourth try for conditioner Michael Dilger on July 6 at Delaware Park before finishing fifth in the Saratoga Special Stakes (G2) last out. Joe Rocco Jr. will be in the saddle Saturday. The remainder of the Breeders’ Futurity field are either maidens or maiden winners, including Lone Sailor, who romped by 11 lengths at Saratoga in his second try last out on September 3; Bravazo, a 4 3/4-length maiden scorer going a mile at Churchill Downs on September 16; and Lone Rock, who wired a one-mile Indiana Grand maiden contest on September 2 by 10 lengths. 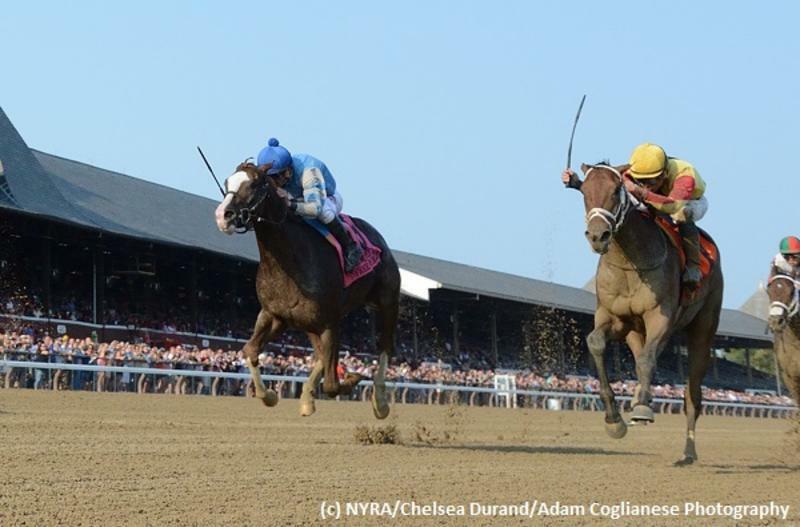 Bourbon Resolution and Enticed both broke their maidens at Saratoga in early September, while maiden Lionite finished third behind the former most recently. Ezmosh completes the Breeders’ Futurity field off a two-length wire job going a mile at Churchill Downs on September 16.